COOL is a BELSPO Research Network funded under the “Interuniversity Poles of Attraction” Program (Grant P7/33). 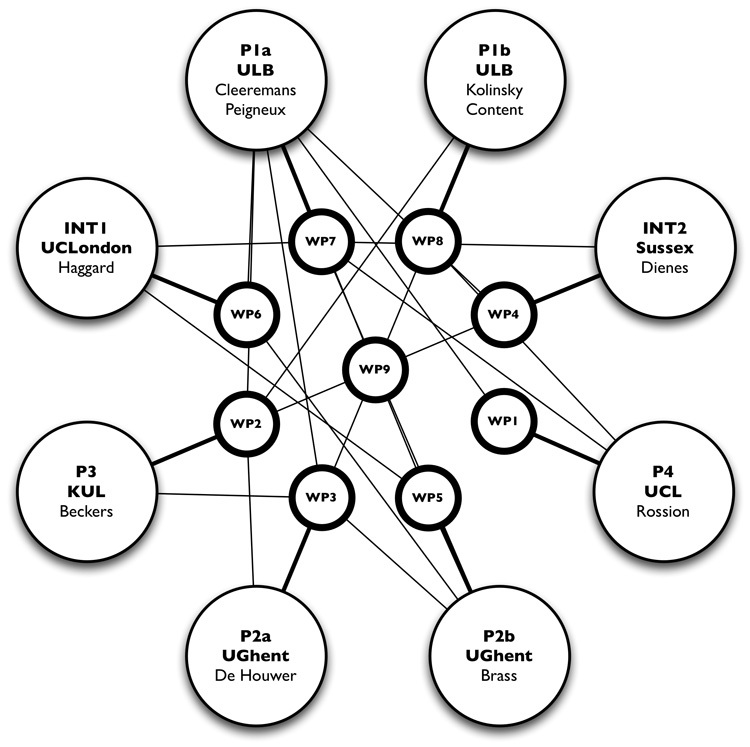 Titled “Mechanisms of conscious and unconscious learning and coordinated by Axel Cleeremans, it assembles teams from the ULB, KUL, UCL, and UG. The network is further enriched by the active collaboration of two foreign partners — Zoltan Dienes from the University of Sussex (U.K.) and Patrick Haggard from University College London (U.K.). The project was initiated in 2012 and will be funded until 2017. Scientifically, the overarching goal of COOL is to contribute to our understanding of the mechanisms of conscious and unconscious learning. Traditional perspectives on learning assume the existence of two dissociable systems. One system learns associations, automatically, in the absence of awareness, and involves mostly bottom-up processes. The second system, by contrast, learns through hypothesis testing and inference, results in propositional representations that are available to consciousness, and involves top-down mechanisms. Here, we propose to fundamentally reconsider the distinction. Instead of assuming that associative learning is always unconscious, automatic and bottom-up and that cognitive learning is always conscious, effortful and top- down, we propose instead that mechanisms of change operate continuously, at all levels of the cognitive hierarchy as well as over different times scales (i.e., over the time course of a single trial, over learning, and over development). From this perspective, the brain is continuously and unconsciously learning to anticipate the consequences of action or activity on itself, on the world, and on other people. To address these issues, COOL is organized in 9 interacting Work Packages that each focus on specific research questions in a manner that seeks that maximize interactions between the different partners. The main objective of WP1 is to explore the cognitive and neural mechanisms of memory acquisition and post- training consolidation for novel faces. Although faces are complex visual patterns, they are learned effortlessly, throughout life, and can be taken to constitute an excellent domain for studying elementary and fundamental mechanisms of learning in humans. The general goal of WP2 is to contribute to our understanding of the processes that govern seemingly basic associative learning phenomena in animals and in developing and adult humans. Animal learning research has often been inspired by a desire to trace elementary learning processes in a pure form, uncontaminated by humans’ ability for deliberate thought and analytical reasoning. The implicit assumption in much of this research tradition is that the performance of animals, lacking complex language and consciousness, demonstrates how far a cognitive system can get without the capacity for symbolic, conscious thought. Similarly, developmental studies on causal learning in children often assume that causal learning performance in pre-school children must reflect a pre-causal stage of cognitive functioning, as such children would lack true insight into cause- effect mechanisms. Again then, performance in these children should reflect a more fundamental level of low-level association formation. Here, in the first two proposed lines of research, we will challenge these fundamental assumptions with respect to both animal conditioning and children’s causal learning. In two further lines of research, we will investigate the inverse claim that under some circumstances, conditioning can take place without awareness in the complete absence of awareness in adult humans, — an even more controversial topic. Traditional associative learning research focused primarily on low-level associative processes that are assumed to operate in both human and non-human animals. In fact, many prominent learning theories (e.g., Rescorla & Wagner) were developed primarily on the basis of research in animals but are assumed to hold also for humans. As such, associative learning as a phenomenon (i.e., change in behavior as the result of relations between events in the world) was confounded with association formation as an underlying mechanism. In line with the overall aims of our project, in WP3 we explore the merits of dissociating these two aspects of learning research. Inspiration for this line of research comes from so-called propositional models of learning that focus on the role of high-level propositional processes in learning (e.g., Mitchell et al.). The impact of these processes can be examined in its most pure form in studies on learning via instructions (see Lovibond). For instance, after instructing participants about the fact that a light will be followed by an aversive shock, the light will evoke a conditioned response even when the light has never actually been followed by a shock. Although instructed conditioning effects are known to occur, they have not been investigated systematically, probably because they do not fit well with the low-level process models that dominated learning research for the past 100 years. Within WP3, we engage in such a systematic study of associative learning via instruction, both at the behavioral and neural level. Moreover, for the first time ever, this research is extended to non-associative forms of learning. WP4 develops one of the proposal’s main goal of understanding the limits of unconscious learning. Specifically, its two objectives are (1) to determine if the development of unconscious structural knowledge of a domain (implicit learning) requires conscious perception of the stimuli; and (2) if unconscious knowledge can be developed of symmetries, i.e. of regularities that go beyond statistical associations. The two issues that define the field of implicit learning are 1) the role of consciousness in learning and 2) the contents of what can be learned without awareness. The two objectives of WP4 thus correspond to the two main issues that define the field. The main goal of WP5 is to understand how different manipulations of top-down control (i.e. sleep deprivation, a belief manipulation and exhausted self-control) affect bottom-up influences on human decisions. Furthermore, we want to understand the brain mechanisms involved in such top-down influences. To address these issues, we will independently manipulate the degree to which bottom-up and top-down sources influence human decisions, using different paradigms. In the first part of the project we will investigate the role of consciousness on bottom-up influences. In the second part we will investigate how manipulating intentional involvement in a decision affects the strength of bottom-up influences. We will use behavioral as well as brain activation measures. On the brain level, we will carry out multivariate pattern analysis (MVPA) to predict intentional decisions from brain activity. This new technique allows determining the brain areas carrying predictive information at different points in time. Furthermore, this method allows computing the accuracy with which a decision can be predicted from brain activity before participants become aware of their decision. This will enable us to quantify the degree of bottom-up and top-down influences on human decisions. The sense of controlling our own actions, and through them events in the outside world, is a fundamental feature of human mental life. The mechanisms underlying this “sense of agency” are poorly understood, though animal learning studies have revealed the basic brain mechanisms of learning and prediction on which sense agency seems to depend. We recently showed (Wenke, Fleming and Haggard) that sense of agency depends not only on the actual result of our actions, but on how efficiently we select which action we perform. When actions were subliminally primed with a compatible left/right cue, participants felt greater control over a subsequent visual effect triggered by the action, compared to when the primes were incompatible. These primes did not predict the effects of action, but simply influenced the ease of action selection. Thus, this aspect of the conscious experience of agency must be prospective, rather than being retrospectively based on action-outcome relations. People frequently report the experience of knowing exactly what to do in a given situation: we suggest this reflects a sense of agency based on selecting what to do, rather than based on action outcomes. WP6 will study the role of instrumental learning in conscious sense of agency. We hypothesise that people must first learn the relation between actions and their consequences: only then can efficiency of action selection be a reliable component of sense of agency. That is, action selection can only contribute prospectively to sense of agency if participants have learned how the selected action actually influences external outcomes. We therefore predict that the contribution of subliminal priming of actions to conscious sense of agency should develop during action-effect learning. To test this hypothesis, participants will learn a statistical relation between 4 different response keys and 4 different shapes of a visual stimulus caused by the keypress. For example, response key 1 will produce a square on 80% of trials, but a circle, triangle or diamond on the remaining 20%. Response 2 will produce a circle on 80% of trials, but a square, triangle or diamond on the remaining 20% and so on. The main goal of WP7 is to explore the contributions of conscious and unconscious learning to consciousness. We examine this issue from a dynamical perspective, putting the emphasis on (1) contrasting different methodologies to assess awareness, and on (2) on exploring the non-monotonic dynamics of consciousness, at different time scales (within-trial processing, learning, & development). Because the workplan for this WP is substantial, its presentation is split in three parts. WP7a is focused on manipulations of quality of representation. WP7b is focused on manipulations of metarepresentations. WP7c is dedicated on exploring the provocative idea (the “radical plasticity thesis” that learning mechanisms actually subtend the emergence of consciousness. Atas, A., Faivre, N., Timmermans, B., Cleeremans, A., & Kouider, S. (in press). Nonconscious learning from crowded sequences. Psychological Science. WP8 aims at exploring how culture influences information processing. WP8a is dedicated to documenting how literacy induces neural recycling and neural competition. We will aim at identifying the behavioral correlates of the neural competition between written words and faces, as it raises the intriguing possibility that face perception suffers as reading skills develop. We will compare the ability (relative accuracy and speed) to perform various face tasks in literate and illiterate individuals: matching of unfamiliar faces and control visual patterns (with and without changes in viewing conditions between the stimuli to match), as well as learning and recognition tasks. Then we will test whether literacy modulates face processing in a qualitative manner. WP8b is dedicated to exploring how learning new cultural categories modifies natural categories. To do so, perceptual categorization training studies in children around school age will be used. WP9 is aimed at coordinating the planned research, both scientifically and insofar as administration is concerned. To assist the scientific coordination, COOL has asked an ad-hoc scientific committee to accompany the project. This committee is currently composed of Pr. David Shanks (UCLondon) and of Pr. James L. McClelland (Stanford).